Soft. Smooth. Plump. Not necessarily words you'd choose to describe yourself ... unless you were talking about your lips, of course. Who on this earth doesn't want her lips to look like the plumped to perfection pout that is Angelina Jolie's? So when this beauty chick came across the Philosophy Artificial Intelligence duo, I just knew it had to be mine. The items in this set are two of my absolute favorites from Philosophy. 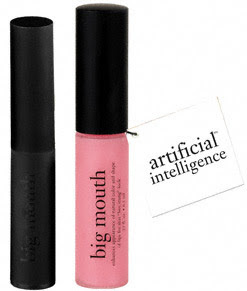 Big Mouth Lip Primer and Big Mouth Lip Plump are definitely two of the most fantastic products that Philosophy has to offer. I've been totally in love with the the lip primer for years. It slicks on easily and leaves the most amazing shine on your lips -- it actually makes it unnecessary for lipgloss or lip balm! However, the Lip Plump -- which comes in pink in this set -- seriously makes your lips bigger and fuller on contact. They'll look beestung in a matter of seconds! The color is also gorgeous -- it's the subtlest hint of pink that really makes your pucker pop. Best of all, it isn't sticky or tacky -- and it doesn't give off that tingly, stingy feeling that other lip plumpers do. While some gals may like that feeling, I tend to hate it and wipe off those glosses and plumpers immediately -- so finding one that doesn't do that is definitely a dream come true!